The 2014 PDC world champion Michael van Gerwen was given a huge scare by Germany's Rene Eidams before edging into the second round of the 2016 tournament. The Dutch world number one needed a tie-break in the deciding set before winning 3-2 at Alexandra Palace. 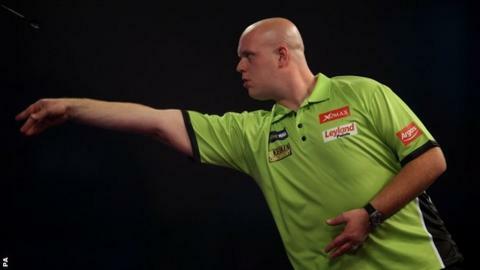 Van Gerwen won the first two sets without dropping a leg. But his opponent roared back and levelled the match at two sets apiece before Van Gerwen upped his game again. Eidams, 26, had beaten Thailand's Thanawat Gaweenuntawong 2-0 in the preliminary round earlier on Friday. In the fifth set, Eidams had levelled it at two legs apiece but with two clear legs needed to secure the set, it was van Gerwen who held his nerve, winning the next two legs to set up a meeting with England's Darren Webster on Sunday, 27 December.